Streetstyle chic essentials. Get inspired by this casual outfit idea for Spring months. 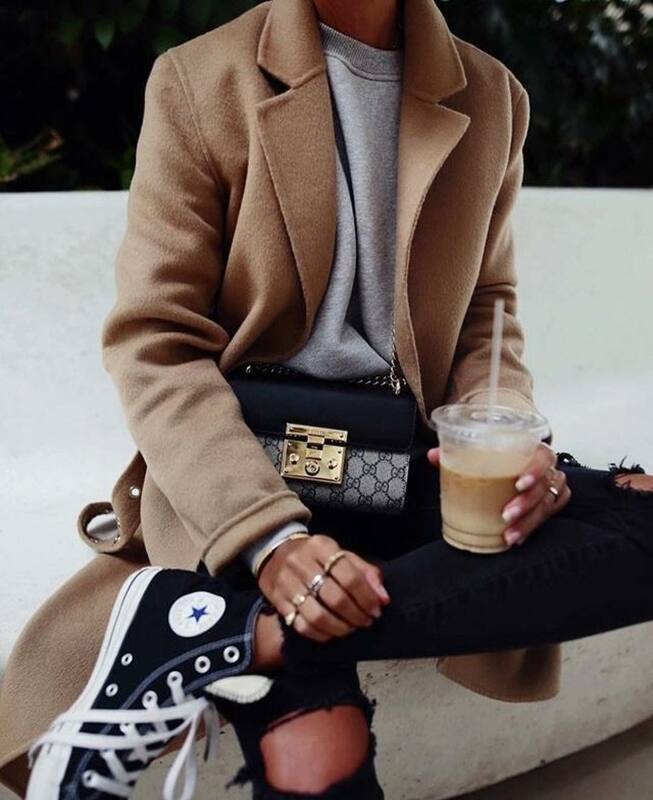 We see a wool camel coat worn with a grey sweatshirt and ripped jeans in black color. Complete this combo with a pair of black trainers. I personally love the relaxed touch of this outfit. You are free to wear it from the streets to concerts. Keep it sporty, casual and cool. Go for a color-blocking sweatshirt and team it with knee-ripped jeans and white trainers. A simple combination for young ladies. You definitely should give it a try! Update your street look with a luxe sweatshirt next Spring! In this article, I gonna show you best ways how to style fashionable sweatshirts next year. This top can be reinvented in different ways, but it is still a good, old sweatshirt that looks both sporty, and chic. Sure, there are cool designs you can freely wear to the gym, but we are talking here about posh and luxe sweatshirts made for working women who want to try something relaxed and casual during weekends and home parties. It’s no wonder why this clothing staple has become so trendy and must-have. Some trends can stay and others should leave us! 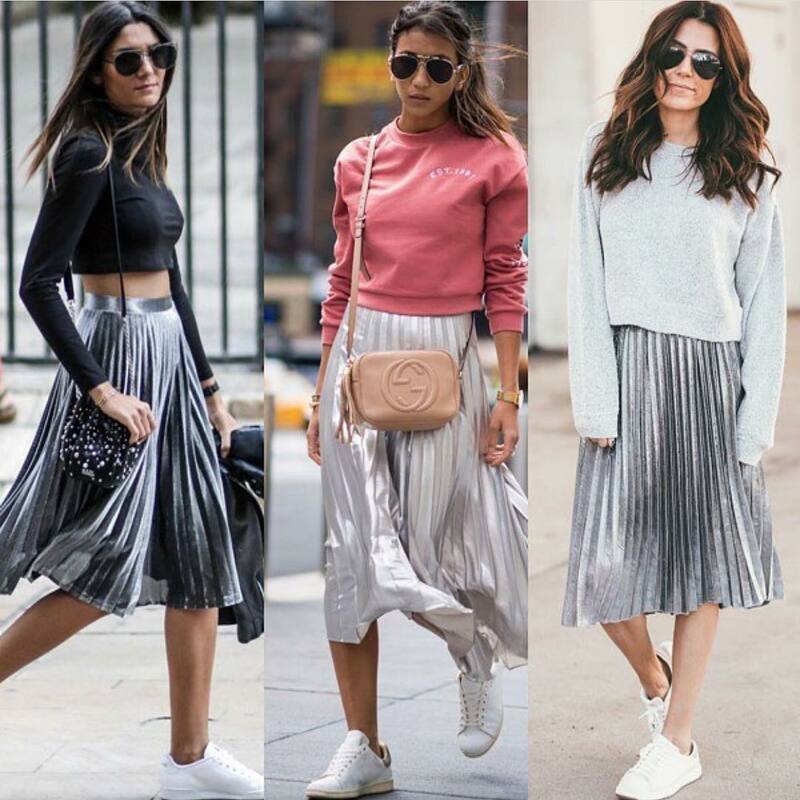 Today’s fashion is all about experimenting with our own style, but there are things that might make you look outdated, that’s why I am here to show you what trends we should keep. Yes, it’s back and you better have it in your wardrobe. The tracksuit is all you need. Why? It’s comfortable, sporty, laidback and looks awesome paired with sneakers. If you are obsessed with sporty life and activewear, then you better give this outfit a try! I am so in love with velour tracksuits, as they make me look very special and tres chic! Every lady has a hidden side which makes her think of wearing gym clothes on the streets. It’s like a workout obsession. I am so happy for people who reconsider tracksuit trend, that’s why this comeback is so special for us. A classic blue tracksuit with white-red stripes on its sides. Try it on with a white bodysuit and white sneakers. It’s time to shop for a new sweater or sweatshirt to make it work for next year. No matter which one of these two styles is your favorite, you can have so much fun with both of them. There are pretty much lots of amazing styles to pick from and I see no problem why sweater can’t be the only go-to Winter piece this 2018. I personally love sweatshirts for their kinda sophisticated and sporty appearance. Anyway, in this street style collection are shown my favorite sweater and sweatshirt designs and ways how to wear them anywhere you go. Get inspired. Adidas sweatshirt is the best choice so far! It will make you look sporty and ready to hit the downtown streets. Pair it with cool shorts or skinny jeans.